and my co-worker on foraminifera.eu. even the tiniest and inconspicuous microfossils. 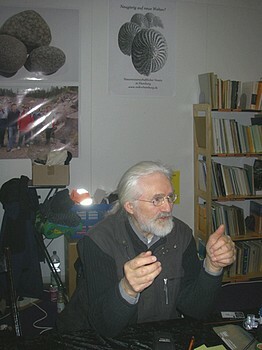 Many specimens shown on foraminifera.eu have been picked and placed on a SEM-stub by him. He is specialized in the production of plummercell slides with each containing hundreds or thousands of specimen, representing most comprehensively a sample. In 2012 we will bring more of his plummercells online. does the imaging and stacking of Karl-Otto's plummercell slides. He has established a smoothly running routine. Georg shoots several images of one field at different levels of sharpness. He stacks the images with Helicon Focus Pro. He sends me the image of each field. My job is to bring the images online with the basic idea to maneuver into single fields from a clickable image of the whole cell.